Storing and transporting equipment can be an issue for a lot of our customers, which is why we have designed the flight case. This is a completely unique and collapsible storage solution that can house your exhibition stand or any other equipment you may use. 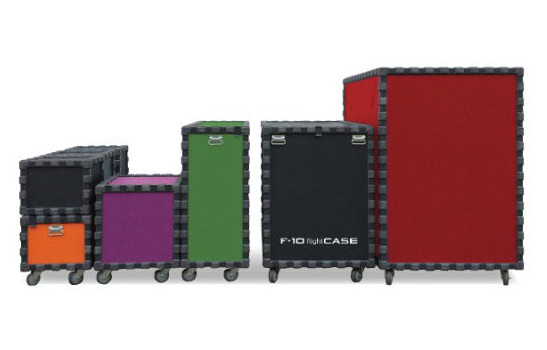 The F-10 flightCASE is a modular case that comes as either a ready to use case or alternatively in the form of a self-assembly kit. The kit includes 6 panels with click on clips so there are no tools required in the assembly process. This process allows you to transport and ship the case with ease and assemble in the desired location, rather than being tied to a large bulky case. This case is made using high quality wheels and bulky edge modules to provide a high impact strength and durability. All of the modules, panels and all assembly elements are manufactured in our Denmark factory. This means that any special demand is possible, such as a size or choice of colour, and lead times can be very short. Check out this extra large custom made flight case.Inner dimensions: 250x110x140 (LxWxH). If you would like any more information about this brand-new storage solution then please get in touch. Alternatively , visit our product page for more information and enquiry form. 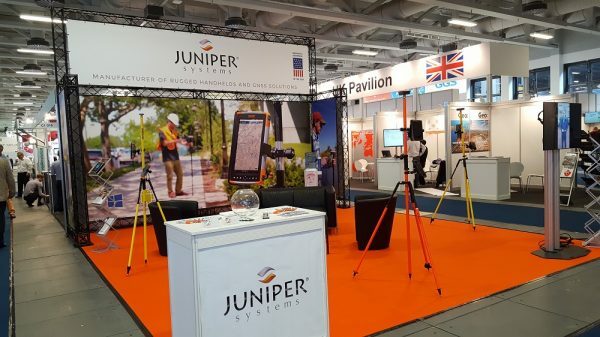 Juniper Systems is a technology company from the United States, they create ultra-rugged and durable handheld computers and data collection solutions. They attended the InterGeo 2017 show in late September this year and were kind enough to send some photos and information on how the stand worked for them. The stand was actually 3.8 meters high compared to a standard 2.4 shell scheme, this allowed them to use height to stand out from the crowd. They could use this extra height because of the modular X-10 CROSSwire stand, which allows pieces to be added or deducted depending on your wishes. 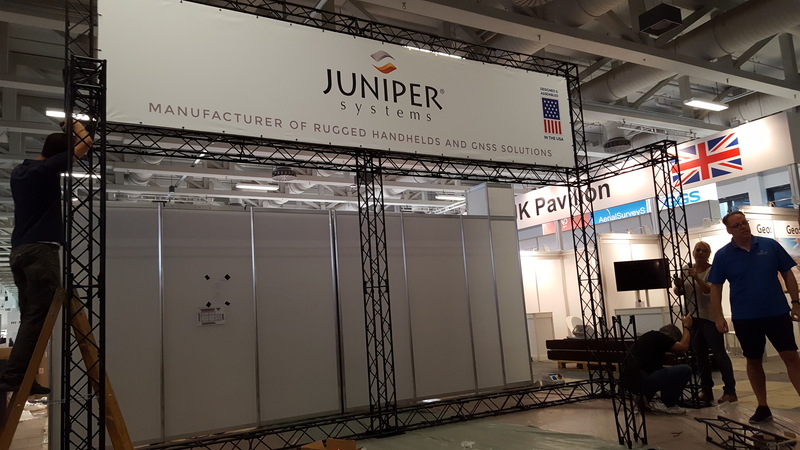 Juniper Systems used our printing service for their banners. Our high-quality service provides full graphic design and printing, no matter the size. The printed banners really personalize a stand and make it stand out from competitors. It gave them an opportunity to use effective branding and make the stand look as professional as possible. 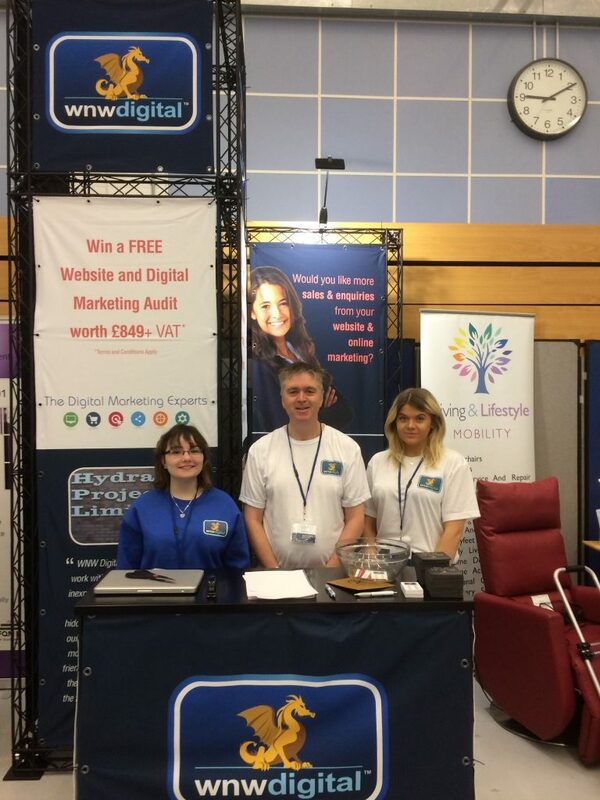 “I wanted to say CONGRATULATIONS because the stand looked absolutely FANTASTIC!! The material was excellent, the colors really popped, and the ‘presence’ that the stand provided at the entry to the hall was AMAZING!! THANK YOU for all your hard work to get the stand components and graphics that we needed to make this show a success! !” – Barbara Sanner, Complete Mktg Solution, on behalf of Juniper Systems Limited. We would love to hear from you if you’ve used any of our equipment for your exhibitions. If you would like any more information on our stand or printing services, please contact us. WNW Digital are a digital marketing and web development agency, providing their expertise to customers in a range of business sectors. 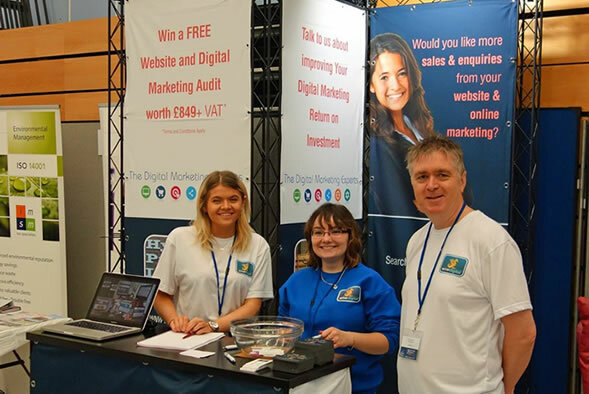 They recently used our X-10 CROSSwire stand at the East Devon Means Business show in Exmouth and were kind enough to share their experience. The X-10 CROSSwire is a modular exhibition stand, so can be rearranged to fit different floor space and reach different heights, according to your space available. It is great for display towers and point of sales displays, and can also be used not only indoors but outdoors as well. WNW Digital rearranged their stand to fit their space by leaving off one of the sides, however they still used the tower to make their stand the noticeable. They could completely customize how big or small they wanted their stand and where they wanted to place the detached table. 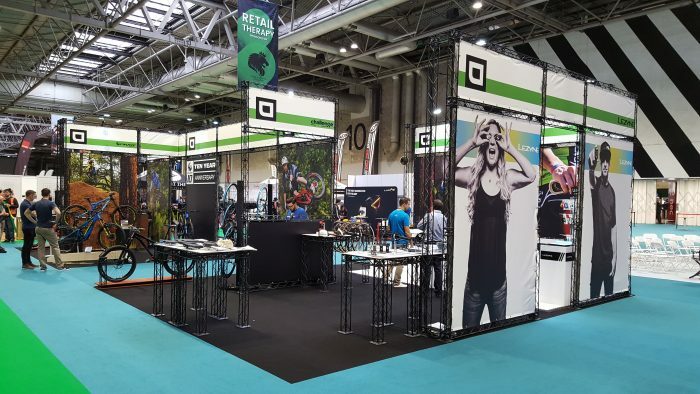 “The stand drew a lot of interest at the relatively small trade show, with lots of questions asked about it and if it was easy to assemble. Assembling the stand didn’t take long and with a few pairs of hands it was up in no time. We found the extra time was more than worth it for the attention the stand and in turn our marketing services gained.” – Tierney Crocker, part of the Digital Marketing team at WNW Digital. 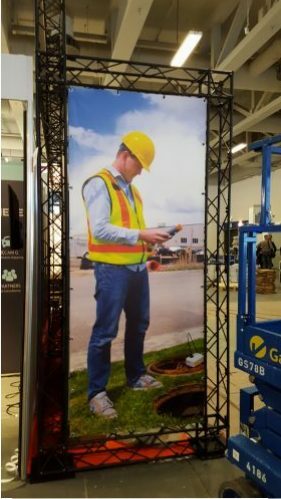 We would love to hear from you if you’ve used any of our equipment for your exhibitions, and if you would like any more information about the X-10 CROSSwire contact us. UPGrade Bikes is a distributor for cycling brands as well as stocking their own in-house brands. 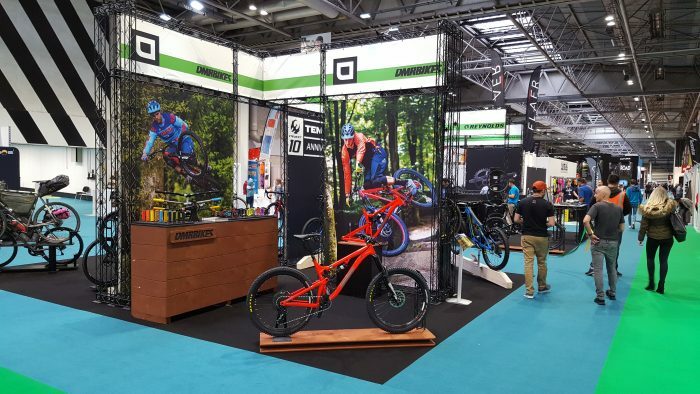 They recently used our X-10 CROSSwire stand at the cycle show in the NEC Birmingham and were kind enough to share photos and even a video of their experience at the show. 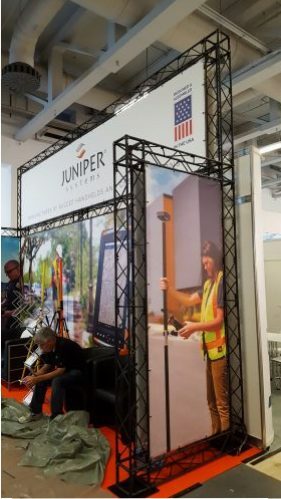 The X-10 CROSSwire is a modular exhibition stand, which means it can be rearranged to fit different floor space and reach different heights. It is a great stand for display towers and point of sales displays, it can also be used not only indoors but outdoors as well because of the sturdy design.